Home > Fire Safety & EMS > Fire Safety Evacuation Supplies & Tools > Fire Extinguisher Arrow Signs > Vinyl Self-Adhesive Fire Extinguisher Arrow Sign - 8" x 12"
Home > Fire Safety & EMS > Fire Extinguisher Arrow Signs > Vinyl Self-Adhesive Fire Extinguisher Arrow Sign - 8" x 12"
Home > Fire Extinguisher Arrow Signs > Vinyl Self-Adhesive Fire Extinguisher Arrow Sign - 8" x 12"
Vinyl Self-Adhesive Fire Extinguisher Arrow Sign - 8" x 12"
These 8" x 12" Fire Extinguisher Signs with down arrow are silk screened using fade resistant UV inks on adhesive vinyl and laminated. These peel and stick arrow signs will ensure your fire extinguisher locations are clearly marked. 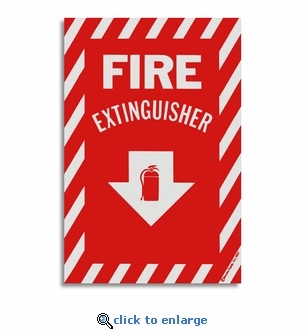 Metal Fire Extinguisher Arrow Sign - 8" x 12"
Rigid Plastic Fire Extinguisher Arrow Sign - 8" x 12"